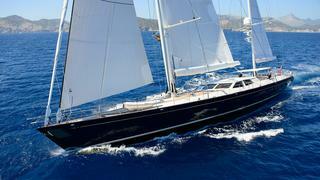 The 40 metre sailing yacht Antares, has had a central agency change and is now listed for sale by Burgess and Y.CO. Lloyds classed, she was built in aluminium by Dutch superyacht yard Royal Huisman as a cutter-rigged ketch to a design by Dixon Yacht Design and delivered in May 2005. Her 1930’s styled Art Deco interior is the work of designers Rhoades Young with French walnut hardwood fitted throughout the yacht along with intricate detailing. On deck to port of this yacht for sale is a large intimate saloon with ample sofas for relaxation and a large 48 inch widescreen television with surround sound while to starboard is the dining area with space to seat eight guests. All the principal sail-handling functions are power operated, either by concealed Rondal reel winches or stainless steel self-tailers. Thus the fully battened mainsail takes just two minutes to hoist. MCA compliant, Antares accommodates up to nine guests in four cabins. These consist of an aft master suite with a king sized bed, a VIP suite to port and a starboard twin cabin with a Pullman berth. The office/study can also be converted into a double cabin and all cabins have full en suite bathroom facilities. Under power, an MTU 8V 2000 M70 engine gives her a cruising speed of 13 knots. Lying in Palma de Mallorca, Spain, Antares is asking €12.5 million.